A sprint is a component of agile methodology that is taught within the MDM program. It emphasizes quick iterations to be completed within 1-3 weeks time periods. Sprints allow teams to prioritize essential features, focus on short term goals and give a snapshot of the total progress on a project. The Scrum Master facilitates the work flow between the team and the product owner. They remove any roadblocks that would hinder a team’s success within a sprint. Scrum Masters also encourage team members to be accountable for their progress within sprints and take responsibility for their work without the need for traditional management techniques. Read below for a glimpse of what a typical one-week sprint looks like from the perspective of a Scrum Master at the Berlin-based game company, Wooga. I am a Producer/Scrum Master at the gaming company Wooga. To give you some context, my current project is in production phase and we’re aiming to globally launch in Q4 of 2016 if we see some promising results during our soft-launch. Found them? Maybe some were really easy to spot. Maybe others are harder because you may not know what they are. Scroll all the way to the bottom to find the answers. All of these items are important for my daily work and I’ll explain how it fits into my week. The sprint board is the central artifact for the team to track our progress at a given sprint. A sprint can last from 1-3 weeks depending on the team and the project. Our team is committed to one-week sprints. The concept of using the board is simple. We define the goals. Each member writes the work item that they will do to fulfill the goal. We move the items from "to-do" to "done" during the course of the week and communicate a short status brief at our daily stand-up every morning. My responsibility as a Scrum Master is to listen in for any impediments or blockers during our stand up and resolve them as soon as possible. My responsibility as a Producer is to remind the team of the priorities of the sprint and forecast what features would be ready to work on in the upcoming weeks if we fully succeed our sprint goal. Why use a physical whiteboard? Two reasons. One: it’s bigger than a standard TV and cheaper than a life-sized touch screen. Two: it’s easier to refer and interact with during our stand up. If you have noticed the TV screen in the picture, it’s displaying an overview of our builds that we create to test our game. We have a setup where we ask a jenkins server to take the latest changes of our project, compile a downloadable build and upload it to beta distribution service (we use hockeyapp). It’s vital for our work to download and frequently test the builds on different mobile devices, to make sure that our game works for the mainstream market. With our mission to create hit-games for the mobile market, we need to test on a wide variety of devices. Compared to Apple’s line up, Android devices alone come in many shapes, sizes and brand names. Fortunately, Wooga does provide us with the wide the variety of devices and it is the team’s responsibility to take care of it and keep it safe. Having a safe that charges the devices over night and has an impenetrable lock is…..key :D.
Every tech company has, at some point in the past, had a theft report over the weekend and it happens here too. Therefore keeping an inventory of the devices and making sure that they’re still in house is a responsibility that I share with the team. If the goal of a given sprint involves submitting a version to the store, we dedicate a lot of time into testing, reporting bugs and fixing them as soon as possible. In the early stages of production, our sprint board became extremely crowded and noisy when we used post-its to report complex bugs. PivotalTracker works best, as it is easier to manage the influx of reported bugs during the test-heavy weeks. I mainly coordinate with the engineers with this tool to clearly identify which bugs are important to fix for the release and bump down the priority of polishing tasks that we can live with when we ship it out. Even though we use two tools to track our progress, it works well for us as they complement each other. We use the physical board to provide a flexible and tangible overview for the overall team progress. Whereas, the digital tool is used to flesh out complex details that the engineers can easily follow up on. I always aim to drink 2-3 litres of water a day. It keeps my head awake and clear. It’s also a good reason for me to get off my seat a couple times in the day to get my refill from the kitchen. I’ve noticed over the past 5 years that when I do keep up with my water goals and my off-desk breaks, I do have extra energy after work to go running or go out with friends to blow off some steam. It’s a very simple ritual but that has an important impact for my day-to-day. Both of them focus on fun yet effective ways to encourage teams to self-improve. Retrospectives are my favorite part of the scrum management framework. It’s at the end of the sprint where our whole team meets to evaluate the way we work and propose solutions to remove recurring impediments and blockers. The reason why it’s my favorite part of the sprint is that it empowers the team to define how they want to improve their processes rather than having managers enforce their terms. Jurgen’s book was just released this past summer. It’s the third iteration of his Management 3.0 philosophy that details best practices to motivate teams in an interactive and playful way. My team is ultimately what is "near and dear" to me. Behind most of the tools that I mentioned above, none of them matter without a team with strong values and the thirst to succeed. What holds all our processes together is the way we interact and keep each other accountable for achieving great work. Without this inter-relationship and our trust in the regular sprint rhythm, our work would be more prone to chaos. While there is so much happening at our day-to-day, we do have Leela from Futurama standing around the corner to remind us to have fun while we work. Her game is already available to download for free and play. Here you go. 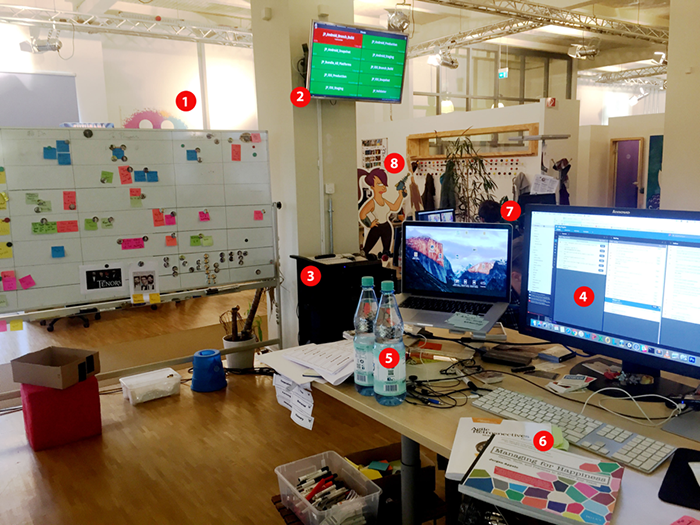 This has been glimpse of what I do and what key elements are involved as a Producer / Scrum Master for a game at Wooga. There is so much more detail about my work that I missed out but hopefully this give you an idea of what is around me that is only a couple steps apart from my desk. Al Sinoy graduated from the program in 2011. Connect with him on LinkedIn.